High Security Safes Gibraltar, a name synonymous with strength and security throughout the world, means the same when applied to Meilink safes. The Gibraltar series combines the very best features available for security and protection. That's why jewelers and financial institutions throughout the world rely on Meilink Gibraltar Safes to meet their security needs. When you are protecting assets reaching into the tens and hundreds of thousands-of-dollars you'll want a safe equal to the task. You'll want UL's very best burglary rated safes and that's just what the Gibraltar line offers, including bolt detent with Autolock* and adjustable ball bearing hinges for smooth door operation for the life of the safe. 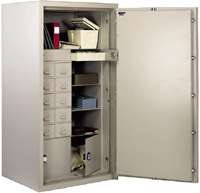 This series includes TL-15 (Tool Resistant), TL-30, and TL-30x6 (6 sided protection) rated safes. These safes must pass a gruelling UL physical entry attack test that includes heavy power tools, sledge hammers, picks, and so forth. Each safe features high quality dial combination locks (digital combination locks optional) with an internal relocking device.